Located in one of our most popular complexes this beautiful town-home is enjoyed by our guests - and most return year after year. After extensive remodeling of every room, the owner has furnished and stocked this getaway with everything you could need for a wonderful vacation!. This condo is located on the outer circle of the complex. The entry level features a fully remodeled kitchen with hard wood floors, new cabinets and new appliances. 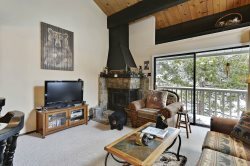 In the living-room you will find a gas fireplace (NO wood needed), TV/DVD and CD player. The dining room will seat 6+ and is open to the kitchen and living room. The sliding glass door opens to the back deck with gas BBQ in the summer. There is also a half bath on this floor. Upstairs there are 2 bedrooms - each with a queen bed and a full bath with tub shower. Also on the second level is the master suite with a King bed - the bath has a wonderfully large glass shower. Internet access is included. Please note we are in the mountains and sometimes there are problems with the internet that are out of our control. Please be considerate - no smoking and no pets. We do not consider Service Animals "pets". Great place right outside Tahoe City. Discovered Whitecaps Pizza in Kings Beach which was awesome.